This post is for Clay. Prayer Flags are ever-present in the Tibetan landscape. Tibetans place them for protection over doorways or gates. They love to leave them on mountain tops and at mountain passes. 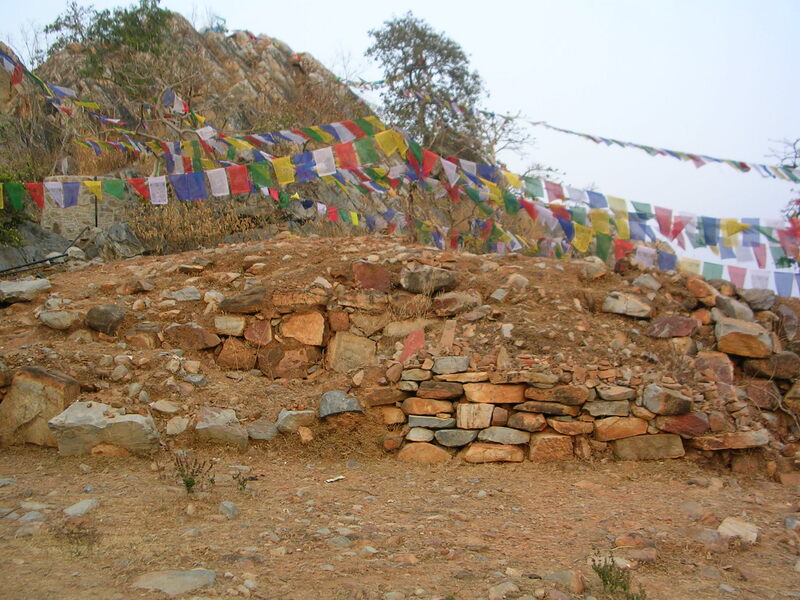 The photo above shows prayer flags left on Vulture Peak in Rajgir, India, the site of recitation by Reverend Gotama of the Heart and Diamond Sutras, famous in the Zen tradition of China and Japan. 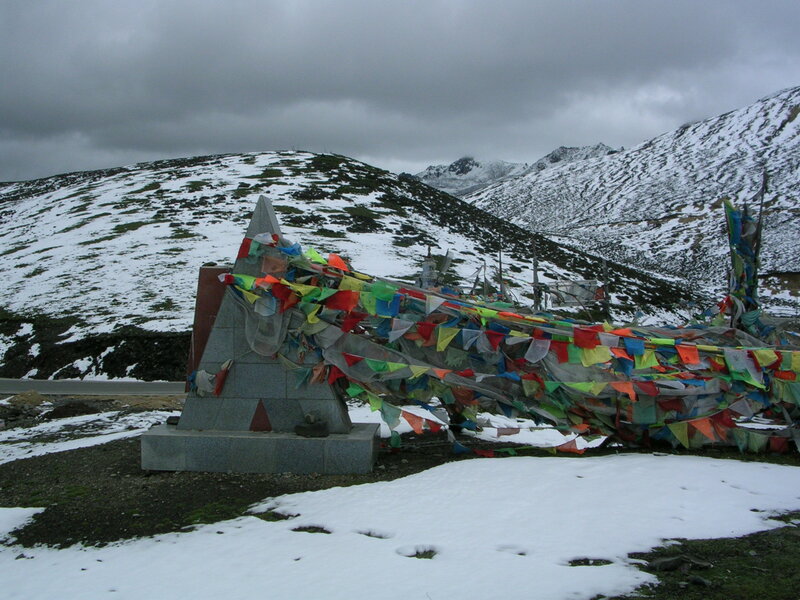 These flags were no doubt left by Tibetan pilgrims at one of the most famous Buddhist sites in India. I took this photo on my trip in 2006. This photo was taken by me at the first 4,000 meter pass on the way from Chengdu to Dzachuka, the headwaters of the Yangtze. This pass is not far from the famous Dzogchen Monastery, one of the most beautiful places in the world. In addition to leaving prayer flags at such places, Tibetans also love to let fly on these occasions small prayer flags called Lung ta or wind horses. I was blue with altitude problems on top of this pass. We let fly a bunch of Lung ta on top of this pass. Prayer flags typically contain images of five sacred animals. In the center is the Lung ta, or wind horse. Surrounding him are the dragon, the garuda, the snow lion, and the tiger. The prayers on the flags are in Tibetan script. I wish I could translate, but, alas, my Tibetan is not adequate. This is what Wikipedia says about these: “Surrounding the Lung ta are various versions of approximately 400 traditional mantras, each dedicated to a particular deity. These writings include mantras from three of the great Buddhist Bodhisattvas: Padmasambhava (Guru Rinpoche), Avalokiteśvara (Chenrezig, the bodhisattva of compassion, and the patron of the Tibetan people), and Manjusri.” Manjusri is the god of wisdom and learning. When I studied Tibetan we always recited Manjusri’s mantra as an aid to comprehension. The five colors of the prayer flags were associated with the five Buddha families. They are always arranged in the order of blue, white, red, green, and yellow. The best reference that I have on the five Buddha families is the book by the scholar / practitioner Reginald Ray, Secret of the Vajra World. The table below is a partial version of a table in his book. Picture men dwelling in a sort of subterranean cavern with a long entrance open to the light on its entire width. Conceive of them as having their legs and necks fettered from childhood, so that they remain in the same spot, able to look forward only, and prevented by the fetters from turning their heads. Picture further the light from a fire burning higher up and at a distance behind them, and between the fire and the prisoners and above them a road along which a low wall has been built, as exhibitors of puppet-shows have partitions before the men themselves, above which they show the puppets. . . .
See also, then, men carrying past the wall implements of all kinds that rise above the wall, and human images and shapes of animals as well, wrought in stone and wood and every material, some of these bearers presumably speaking and others silent. . . do you not think that they would suppose that in naming the things that they saw that they were naming passing objects? . . . When one was freed from his fetters . . .and to lift up his eyes to the light . . . what would you say would be his answer if someone told him that what he had seen before was all a cheat and an illusion, but that now being nearer to reality and turned toward more real things, he saw more truly . . .
And if he were compelled to look at the light . . . if you assume that the ascent and the contemplation of the things above is the soul’s ascension to the intelligible region, you will not miss my surmise, since that is what you desire to hear. But God knows whether it is true. But, at any rate, my dream as it appears to me is that in the region of the known the last thing to be seen and hardly seen is the idea of the good, and that when seen it must needs point us to the conclusion that this is indeed the cause for all things of all that is right and beautiful, giving birth in the visible world to light, and the author of light and itself in the intelligible world being the authentic source of truth and reason, and that anyone who is to act wisely in private or public must have caught sight of this (Book VII, the Republic, Shorey translation). The last significant allusion to the TOI in the Republic occurs in the Book X as part of the warm-up to the banning of poetry from the ideal state. Socrates says, “We are in the habit, I take it, of positing a single idea or form in the case of the various multiplicities to which we give the same name. . . Are we not in the habit of saying that craftsman who produces either of them (tables or couches) fixes his eyes on the idea or form, and so makes in the one case the couches and in the other the tables that we use, and similarly of other things” (Shorey translation, Book X). Socrates then goes on to identify three kinds of producers, the craftsman, the painter, and the God, who create three different kinds of products, couches and tables, images of these sensible objects, and the ideas of these sensible objects. These arguments, taken as a whole, may be considered to constitute Plato’s version of the TOI in the Republic. This theory may be the most powerful bit of metaphysics in the history of European culture, having a central role and influence in the dominant strands of European life, from Christian religion to contemporary philosophy and mathematics. What are we to make of this theory? What was the TOI and to what extent is it relevant to us today? To what extent did Plato remain faithful to this version of TOI in later dialogues? I want to present the reactions of several commentators on these questions before tackling them myself. The commentators come from various places and times, one from Plato’s immediate circle, one from 500 years after Plato, and several from the century recently past. 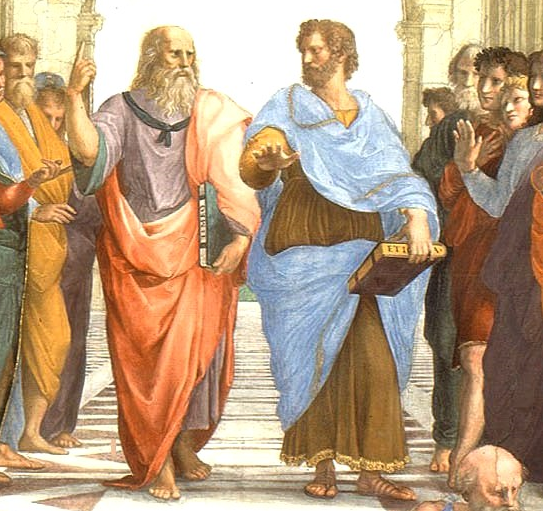 It is no accident that in Raphael’s incredible fresco in the Vatican of the School of Athens Plato and Aristotle are shown together discoursing in the very center. Diogenes Laertius says that “Aristotle was Plato’s most genuine disciple.” He tells us that Aristotle joined the Academy at age 17 and stayed with Plato for twenty years. He says that Aristotle “seceded from the Academy while Plato was still alive.” To what extent did Aristotle remain a disciple and what caused him to leave the Academy? The philosophies described above (of Pythagoras and Parmenides) were succeeded by the system of Plato, which in most respects accorded with them, but contained also certain peculiar features distinct from the philosophy of the Italians. In his youth Plato first became acquainted with Cratylus and the Heraclitean doctrines – that the whole sensible world is always in a state of flux, and that there is no scientific knowledge of it – and in after years he still held these opinions. And when Socrates, disregarding the physical universe and confining his study to moral questions, sought in this sphere for the universal and was the first to concentrate upon definition, Plato followed him and assumed that the problem of definition is concerned not with any sensible thing but with entities of another kind; for the reason that there can be no general definition of sensible things which are always changing. These entities he called “Ideas” and held that all sensible things are named after them and in relation to them; for the plurality of things which bear the same name as the Forms exist by participation in them. . .
Further, he states that besides sensible things and the Forms there exists an intermediate class, the objects of mathematics, which differ from sensible things in being eternal and immutable, and from the Forms in that there are many similar objects of mathematics, whereas each Form is itself unique. Now since the Forms are the causes of everything else, he supposed that their elements are the elements of all things. Accordingly the material principle is the “Great and Small,” and the essence <or formal principle> is the One, since the numbers are derived from the “Great and Small” by participation in the One. In treating the One as a substance instead of a predicate of some other entity, his teaching resembles that of the Pythagoreans, and also agrees with it in stating that the numbers are the causes of Being in everything else; but it is peculiar to him to posit a duality instead of a single Unlimited, and to make the Unlimited consist of the “Great and Small.” He is also peculiar in regarding the numbers as distinct from sensible things, whereas they hold that things themselves are <emphasis> numbers, nor do they posit an intermediate class of mathematical objects. His distinction of the One and the numbers from ordinary things (in which he differed from the Pythagoreans) and his introduction of the Forms were due to his investigation of logic (the earlier thinkers were strangers to Dialectic) . . .
As for those who posit the Forms as causes, in the first place in their attempt to find the causes of things in our sensible world, they introduced an equal number of other entities – as though a man who wishes to count things should suppose that it would be impossible when they are few, and should attempt to count them when he has added to them. For the Forms are as many as, or not fewer then, the things in search of whose causes these thinkers were led to the Forms; because corresponding to each thing there is a synonymous entity apart from the substances (and in the case of non-substantial things there is a One over the Many), both in our everyday world and in the realm of eternal entities (Metaphysics, 990b). He then re-frames the argument that Plato presented in the Parmenides dialogue and names it the “Third Man” argument (TMA). This is the argument that if X is a man due to the fact that he resembles the Idea of man, there must be a third “man” in whom the “man-ness” of these two is united. Again, not one of the arguments by which we (Platonists) try to prove that the Forms exist demonstrates our point: from some of them no necessary conclusion follows, and from others it follows that there are Forms of things of which we hold that there are no Forms. For according to the arguments from the sciences there will be Forms of all things of which there are sciences; and according to the “One-over-Many” argument that “we have some conception of what has perished,” of perishable things; because we have a mental picture of these things. Again, of Plato’s more exact arguments some establish Ideas of Relations, which we do not hold to form a separate genus; and others state the “Third Man.” And in general the argument for the Forms does away with things which are more important to us as exponents of the Forms than the existence of Ideas; for they imply that it is not the Dyad that is primary, but Number; and that the relative is prior to the absolute; and all the other conclusions in respect of which certain persons, by following up the views held about the Ideas, have gone against the principles of the theory. Again, according to the assumption by which we hold that the Ideas exist, there will be Forms not only of substances but of many other things (since the concept is one not only in the case of substances, but also in the case of all other things; and there are sciences not only of substances but of other things as well; and there are a thousand other similar consequences); but according to logical necessity, and from the views generally held about them, it follows that if the Forms are participated in, then there can only be Ideas of substances (Metaphysics, 990b). Above all we might examine the question what on earth the Forms contribute to sensible things, whether eternal or subject to generation and decay; for they are not the cause of any motion or change in them. Again, they are no help towards knowledge of other things (for they are not the substance of things, otherwise they would be in things), nor to their existence, since they are not present in the thinks which partake of them. . . Again, other things are not in any accepted sense derived from the Forms. To say that the Forms are patterns, and that other things participate in them, is to use empty phrases and poetical metaphors; for what is it that fashions things on the model of the Ideas? . . . hence how can the Ideas, if they are substances of things, exist in separation from them? It is said in the Phaedo that the Forms are the causes both of existence and of generation. Yet, assuming that the Forms exist, still the things which participate in them are not generated unless there is something to impart motion (Metaphysics 991b). In general, although Wisdom is concerned with the cause of visible things, we have ignored this question (for we have no account to give of the cause from which change arises), and in the belief that we are accounting for their substance we assert the existence of other substances of the former, our explanation is worthless – for “participation,” as we have said before, means nothing (Metaphysics 992a). Aristotle makes a point here of speaking as a “Platonist.” What I take from this is that Aristotle’s criticism is that the Forms cannot be a separate ontological realm, but rather must follow substance, like a shadow follows the man. This seems like a reasonable complaint to me, whatever we think of the logic of Aristotle’s arguments. Diogenes Laertius probably lived in the third century AD and wrote biographies of dozens of the philosophers of the ancient Greek world from Pythagoras to Sextus Empiricus. The name by which we know him was probably a pseudonym. He was no philosopher and not necessarily a very reliable witness for the biographical facts that he provides in his books. His value today is chiefly that so many of the Ancient Greek texts have disappeared, leaving his quotations and references among the few scraps that we have about many of these writers. His entry on Plato is the longest of his texts, taking up an entire book in his Lives of the Eminent Philosophers (Book III in Volume I of the Loeb edition translated into English by R. D. Hicks). Diogenes lists a series of doctrines of Plato, mostly apparently taken from the Timaeus: “The doctrines he approved are these. He held that the soul is immortal, that by transmigration it puts on many bodies (Hicks’s note: Tim., 42B ff), and that it has a numerical first principle, whereas the first principle of the body is geometrical (Tim., 54A ff) and he defined the soul as the idea of vital breath diffused in all directions. He held that it is self-moved and tripartite, the rational part of it having its seat in the head, the passionate part about the heart, while the appetitive is placed in the region of the navel and the liver (Tim. 69C ff).” We can see from this quote that Diogenes certainly had some notion of Plato’s philosophy, but also that he preferred the good story to deep understanding. Here we have a modern philosopher who, while not an expert on Plato, was in any case a philosopher of first rank. In his widely popular History of Western Philosophy, Russell devotes a chapter to the TOI. He considers the TOI of “great importance” which is “partly logical, partly metaphysical.” The logical part Russell finds useful in its emphasis on the universal quality of certain words. He has no quarrel with these universal words as being “eternal” in that they have no place in space and time. I would have some quarrel here, but we will leave that for the moment. He explains the TOI with reference to the passages from the Republic about the bed and the parable of the cave that I have indicated above. Russell then goes on to consider what he says is “one of the most remarkable cases in history of self-criticism by a philosopher” in Plato’s dialogue, the Parmenides. Ironically, while he assumes that what Plato was doing here was in fact profound self-criticism, an assumption that is questionable, he seems to have not understood another case of self-criticism closer to home, namely Wittgenstein’s thorough- going critique of the theory of a book for which Russell wrote an enthusiastic introduction, the Tractatus. Russell relates the well-known passage from the dialogue in which Parmenides, in Athens with his purported sidekick Zeno to attend the Panathenaic celebrations, asks Socrates whether there were ideas or forms for such things as hair, mud, and dirt; a question which Socrates fumbles in confusion. This is the only location in a Platonic dialogue where Socrates is bested by an opponent, in which Parmenides utters the killing conclusion, “Yes Socrates, . . . for you are still young and philosophy has not yet taken hold upon you, as I think it will later” (Fowler’s translation from the Loeb edition). These last two arguments constitute the “greatest difficulty” for the TOI, according to Parmenides. It seems that these concerns still linger around this point for the TOI. Witness the recent Stanford Encyclopedia article on the Parmenides (http://plato.stanford.edu/entries/plato-parmenides/#GreDif133) which ends with the statement, “The aptly-named Greatest Difficulty is then left as a challenge for future work”. The challenge remains, 2,500 years and counting. I will have more to say about this below. With this ordering established, Ross proceeds to consider Plato’s presentation of the TOI in the dialogues which bear on the TOI in chronological order. This dialogue presents the first sustained use of the TOI as a secondary theme to the primary argument for the immortality of the soul. In his discussion with Simmias, Socrates says, “If, as we are always saying, the beautiful exists, and the good, and every essence of that kind, and if we refer all our sensations to these, which we find existed previously and are now ours, and compare our sensations with these, is it not a necessary inference that just as these abstractions exist, so our souls existed before we were born; and if these abstractions do not exist, our argument is of no force? Is this the case and is it equally certain that provided these things exist our souls also existed before we were born, and that if these do not exist neither did our souls?” (79 D, Fowler’s translation) Since Socrates’s interlocutor here has no doubt about the certainty of the existence of souls, Plato here uses this as an argument for the existence of ideas. Not that souls are ideas, but that they are similarly eternal. Later on in the dialogue Socrates says, “If anyone tells me that what makes a thing beautiful is its lovely colour, or its shape or anything else of the sort, I let all that go, for all those things confuse me, and I hold simple and plainly and perhaps foolishly to this, that nothing else makes it beautiful but the presence or communion (call it which you please) of absolute beauty, however it may have been gained; about the way in which it happens, I make no positive statement as yet, but I do insist that beautiful things are made beautiful by beauty (100 D).” It is clear that by the time of the Phaedo, Plato is firmly committed to the TOI. Ross asks the question as to whether the TOI in the Phaedo implies the separate existence of the Ideas. He suggests that the reference cited above (79 D) implies that either 1) Plato failed to recognize that the doctrine of anamnesis implies previous direct knowledge of disembodied Ideas or 2) that he saw and accepted this. Ross here cites Aristotle’s “consistent statement” that Plato believe d in “separate” Ideas and says “it is very difficult to suppose that after nineteen years spend in Plato’s School Aristotle could have been so misinformed about so important a matter.” Harold Cherniss has a very different answer on the credibility of Aristotle’s testimony. I will try to address that further on. The watershed that Ross finds in the Republic is that instead of declaring the particulars as real, he “from now on” is committed “until in the Sophistes he sees a better way” to “a false and dangerous disparagement of all particulars, in the supposed interest of Forms.” Ross goes through the passages on the Sun, the divided line, and the simile of the cave that I have presented above. He says that he wants to steer clear of interpreting these passages in light of what Plato says about the TOI in later dialogues. He says, “We are studying the development of Plato’s thought, and what we have to do is to try to discover what was in his mind when he wrote these passages.” With this Ross declares himself clearly on the side of the “Develomentalists” as opposed to the “Unitarians” represented by Shorey (The Unity of Plato’s Thought). Ross feels that it is mathematics which Plato has in mind when he speaks about the intermediate intelligible. Plato’s theory is that geometry consists not in deducing by pure logic from pure figures, but in apprehending the implication of figures drawn by hand. Ross says that Plato “opposes in advance two theories which have found favor in modern times – the empirical theory represented by Mill, which holds that geometry is an inductive science reasoning from observation of sensible figures and reaching approximately true generalizations about them and the rationalistic or logistic theory which regards geometry as proceeding by pure reasoning alone from axioms, definitions, and postulates relating to perfect geometrical figures, without any need for spatial intuition.” The alternative theory that Ross leaves out here, is one which I will discuss in more detail below, constructivism or intuitionism. The Parmenides dialogue became an attractor for scholarly debate in the twentieth century. Taylor says that it “has always been regarded as an extremely puzzling” dialogue “and the most divergent views have been held about its main purpose.” Its first part presents the famous criticisms of the TOI by Parmenides and Socrates’s inability to defend it. The second part presents a series of examinations of eight theses about the One and Unity which come to apparently contradictory conclusions. Taylor says “Now it is quite certain that Plato never dreamed of denying the law of contradiction (Plato, the Man and His Work, p 850). Graham Priest, in a very recent article (http://gramata.univ-paris1.fr/Plato/spip.php?article120) reaches the opposite conclusion. Shorey says that the dialogue “is not meant to be taken seriously” (The Unity of Plato’s Thought). Many others, including the present reviewer take it very seriously. If a number of things, a, b, c are all F, there must be a single Form F-ness, in virtue of which we apprehend a,b,c, as all F.
If a,b,c and F-ness are all F, there must be another form, F-ness1, in virtue of which we apprehend a,b,c, and F-ness as all F.
This seems to lead to an infinite regress. Vlastos claims, however, that the logic is flawed, in that the regress occurs because of the replacement of F-ness by F-ness1. Vlastos proposed potential fixes to this argument using “self-predication”, but this need not concern us here. I actually think that Vlastos’s problem is manufactured by him, and not by Plato’s words. But a discussion of this would take us too far afield. The point that I want to emphasize here is that whether or not the TMA scuttles the TOI, or at least the “participation” version of it, Plato does not seem to have felt that it did so, since in the course of the discussion he has Parmenides say, “you are trying to define prematurely . . . each one of the Forms, before you are properly trained” and “Only an ingenious man will be able to understand that for each thing there is some Kind, a being itself by itself, but only someone even more remarkable will be able to discover it and teach it to another who has already thoroughly examined all these difficulties” (135 b, translation by Arnold Hermann and Sylvanna Chrysakopoulou). These words seem to recognize the problem posed by the “greatest difficulty” but imply that some smart thinking will overcome it. Considering that this “greatest difficulty” is here dropped and not taken up again in Plato’s work (as far as we know) I see this in another light, as a leap of faith, when reason has failed. 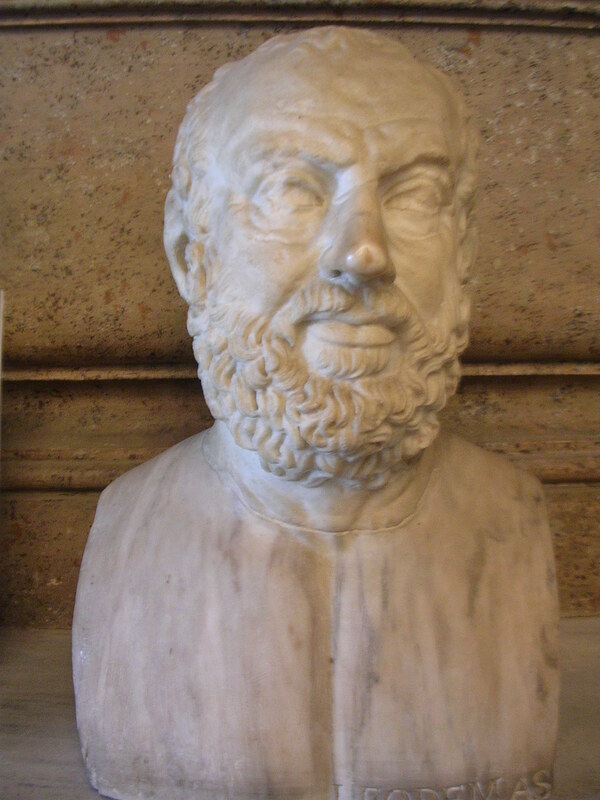 I think that the “greatest difficulty” hits the nail squarely on the head: “There are many difficulties as well, Parmenides said, but the greatest one is this: if someone were to say that the Forms – such as we claim they must be – are not even fit to be known, one would be unable to prove him wrong, unless the disputer happened to be widely experienced and not unintelligent, and also willing to follow the proof through numerous remote arguments. Otherwise, the person who requires that they be unknowable would remain unconvinced (133 b).” I, for example, remain unconvinced 2,500 years later. In his discussion of the Theaetetus Ross suggests that since in the Parmenides Plato claims that, without the TOI, discourse would be impossible; in the Theaetetus, which Ross reckons was written not long after the first part of the Parmenides, Plato leaves the TOI and turns to developing a theory of knowledge, upon which to build the TOI. That the Theaetetus ends in aporia is for me a telling indicator of the shakiness of the TOI itself. Plato himself in an earlier phase. Ross opts for option 4. He translates a long passage (248 C4 – 249 b 12) to the effect that that change, life, soul, and understanding have a place in that which is perfectly real; that both change and unchanging things (the Ideas) have reality. This is not to be understood as a great departure from the supposedly monist theory of Parmenides. In fact it is recognition of both of the two “worlds” in Parmenides’s poem. The stranger then takes the discussion to the “greatest of the kinds of forms”: Being, Sameness, Difference, Motion, and Rest. The conclusion here is that, “while no Form can be ‘mixed’ with another in the sense of being identified with it, there are three Forms – Being, Sameness, and Difference – that can be predicated of all Forms, certain pairs of Forms of which one can be predicted of the other, and other pairs of Forms of which neither can be predicated of the other.” The science which discovers how Forms blend and apply to one another is the science of dialectic, philosophy. Ross concludes his discussion of the Sophistes with an appreciation of the “communion of the classes . . . the discovery of certain very obvious relations between five terms.” He says, “ . . . what is important is the establishment of the principle that the Forms are neither a collection of entities standing in no positive relations to each other, nor yet are capable of entering into all storms of relations to one another – that they form, indeed, a system.” This is suggestive of Wittgenstein’s “games form a family” from the Philosophical Investigations; ironical, because I think Wittgenstein’s constructivism represents a true alternative to the TOI. 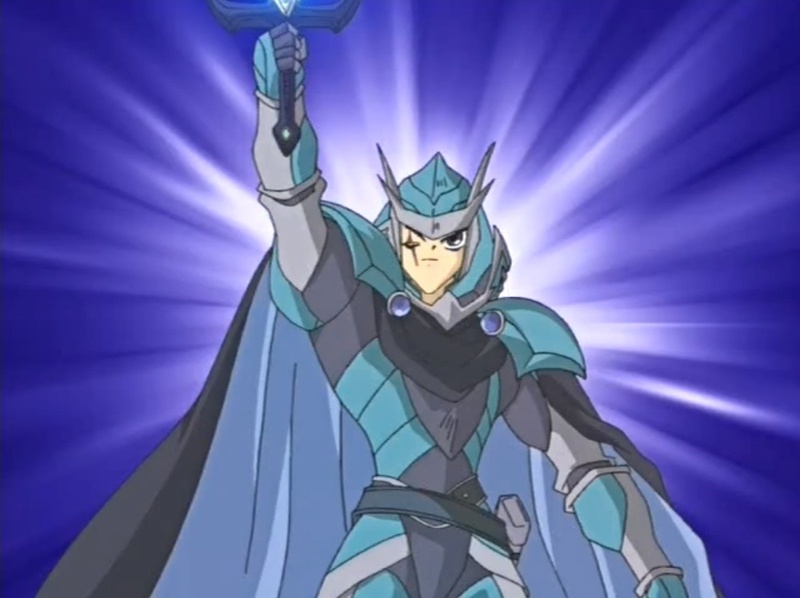 Timaeus the manga character was a legendary knight in the Battle of Atlantis. Timaeus in Plato’s dialogue of the same name is a famous astronomer and mathematician who leads Socrates around on a tour of Plato’s cosmology. The Timaeus (the dialogue) might well seem a regression in Plato’s thought from the more complex dialogues of the Parmenides and Sophistes to the more dogmatic version of the TOI of the Phaedo. The work is scarcely a dialogue at all, but rather an extended rant by Timaeus set only nominally within a discussion between Socrates; Hermocrates, apparently a retired Syracusan general, and Critias, the leader of the thirty tyrants. The dialogue starts with reference to the discussion presented in the Republic which is referenced as taking place “yesterday.” Socrates then briefly recapitulates the main themes of the Republic. The remainder of the Timaeus includes three chief parts: 1) an introduction discussing the origins of Mediterranean civilization, 2) the making of the soul of the world, and 3) the making of man’s soul and body. The first bit is a fourth-hand story told by Critias of a tale told to him by his own grandfather when Critias was ten of a story originally told by Solon of a story told to him by a priest in the “Delta of the Nile”. The priest tells a brief story of the Egyptian people: “And the duration of our civilization as set down in our sacred writings is 8000 years. Of the citizens, then who lived 9000 years ago, I will declare to you briefly certain laws and the noblest of the deeds they performed . . .” (23 E). He tells Solon how “the Goddess had furnished you, before all others, with all this orderly and regular system, she established your State, choosing the spot wherein you were born since she perceived therein a climate duly blended, and how that it would bring forth men of supreme wisdom.” He tells him that “in this island of Atlantis there existed a confederation of kings, of great and marvellous (sic) power . . . ” This bit has little to say about the TOI but sets the stage for Plato’s “true” explanation of how order was instituted from the presumed chaos of the original universe. What Plato attempts in the main central and concluding parts is “a thorough-going teleological explanation of the universe,” in the words of the Loeb translator Bury. At the beginning of the central section Timaeus gives us the distinction between Being and Becoming that Plato inherited from Parmenides’s poem, a dichotomy which has had incredible staying power in Western philosophy. Being is changeless, eternal, self-existent, the “world” of Ideas. Becoming is transient, not truly existent, the “world” of irrational sensation. If you will grant Plato this, all of the rest follows: the world soul, the δημιουρλος (Demiourgos), and the whole gamut of Western religion and dogmatic philosophy from Augustine to Berkeley and Kant and, yes, even Einstein. Now first of all we must, in my judgement (sic), make the following distinction. What is that which is Existent always and has no Becoming? And what is that which is Becoming always and never is Existent? Now the one of these is apprehensible by thought with the aid of reasoning, since it is ever uniformly existent; whereas the other is an object of opinion with the aid of unreasoning sensation, since it becomes and perishes and is never really existent. Again, everything which becomes must of necessity become owing to some Cause; for without a cause it is impossible to attain becoming. But when the artificer of any object, in forming its shape and quality, keeps his gaze fixed on that which is uniform, using a model of this kind, that object, executed in this way, must of necessity be beautiful; but whenever he gazes at that which has come into existence and uses a created model, the object thus executed is not beautiful (28 a, Bury translation). Thus the distinction of the Forms and sensible things is placed in the forefront of the discourse. The world, being apprehensible by the senses (he continues) (28 b 1 – 29 b 2) must have come into being, and have done so by some agency; and its maker must have looked to an unchanging model, i.e. to a Form; for only so will the product be good. The framer of the universe was good, and desired that all things should come as near as possible to being like himself. He therefore ‘took over all that was visible – not at rest but in discordant and unordered motion – and brought it from disorder into order’ (30 a 3-6). Since nothing that is without intelligence can be better off than that which has intelligence, and since intelligence cannot be present without soul, in framing the universe ‘he fashioned reason within a soul, and the soul within body’ (30 a 6 – b 6). The model used by the divine craftsman (the Demiourgos) could not be any particular living creature; it must be that which embraces them all, ‘for that embraces and contains within itself all the intelligible living creatures, just as this world contains ourselves and all other creatures that have been formed as things visible (30 c 2 – d 1). What follows is Plato’s lone attempt at cosmology in his extant works, mostly modeled after Empedocles. Ross emphasizes how in the course of explaining this cosmology the “necessity” of the Ideas is emphasized, deriving from the assumption that nothing intelligible based on δοξα (opinion) could possibly be true. Reason must therefore be based on the Ideas. Why? This is the Platonic leap of faith elaborated by the TOI. Ross says, “Plato here (51 d 3 – 52 a 7) treats as the essential reason for believing in the existence of Forms the difference between knowledge and true opinion.” Thus the “mature” TOI of the Timaeus rests on the foundation of the Theaetetus. But the Theaetetus ends in aporia! In the Timaeus we go from aporia to faith. The first question is whether we should believe that such unities really exist; the second, how these unities, each of which is one, always the same, and admitting neither generation nor destruction, can nevertheless be permanently this one unity; and the third, how in the infinite number of things which come into being this unity, whether we are to assume that it is dispersed and has become many, or that it is entirely separated from itself – which would seem to be the most impossible notion at all – being the same and one, is to be at the same time in one and in many. These are the questions, Protarchus, about this kind of one and many, not those others, which cause the utmost perplexity, if ill solved, and are, if well solved, of the greatest assistance (15 b 1 – c 3). Well at least Plato here is back to asking questions! But Ross explains that Plato never solves the first question, assuming that if he adequately handles the following, it will come along in the wash. How Plato attempts to answer the second question is to suggest that one must proceed by dichotomy (division) as described in the Phaedrus, the Sophistes, and the Politicus. Ross concludes that Plato never really solves this second question. I think the solution is impossible by logic; only by faith can it be achieved. After a brief discussion of the TOI in the Laws and the Seventh Letter, which illuminates nothing particularly new, in the remainder of his book Ross discusses several topics, the most significant being, to this reviewer, Aristotle’s depiction of Plato’s “unwritten doctrines” and his critique of the TOI. This is mainly offered as a response to Harold Cherniss’s influential book Aristotle’s Criticism of Plato and the Academy (ACPA), which argues that there never was an unwritten doctrine and that Aristotle’s arguments against the TOI are so fraught with logical flaws as to render them worthless. The strongest point in Professor Cherniss’s argument is one which he has effectively made – that what Aristotle says about Plato often betrays misunderstandings which a few well-chosen questions to Plato would have removed. Aristotle was not the pure blunderer that Prof. Cherniss makes him out to have been, but it must be admitted that he was too ready to adopt interpretations of Plato either because they fitted in with his own preconceptions, or because they gave him an opportunity of criticism. His long criticism in Books M and N of the Metaphysics, in particular, contains far too many instances of both of these faults, and Prof. Cherniss has exposed many of them with great skill. But I do not think for a moment that he has established his case that all that Aristotle says about Plato that cannot be verified from the dialogues is pure misunderstanding or misrepresentation. Ross finds the claim by Cherniss that Plato gave no oral instruction to the members of the Academy including, for 19 years, Aristotle himself, to have little “intrinsic probability”. It should be remembered that Ross was no illiterate when it comes to Aristotle. He had been the general editor for the Oxford translation of Aristotle which appeared in 1908 and his translation of the Metaphysics is still used in the current edition of The (Oxford) Complete Works of Aristotle edited by Jonathan Barnes. The essence of the theory of Ideas lay in the conscious recognition of the fact that there is a class of entities, for which the best name is probably ‘universals’, that are entirely different from sensible things. Any use of language involves the recognition, either conscious or unconscious, of the fat that there are such entities; for every word used, except proper names – every abstract noun, even every pronoun and every preposition – is a name for something of which there are or may be instances. The first step towards the conscious recognition of this class of entities was, if we may believe Aristotle, taken by Socrates when he concentrated on the search for definitions. . . . Plato did see that what was common to all searches for definitions was the assumption that there are such things as universals. He saw too, that the objective difference between universals and particulars answers to the subjective difference between science and sense-perceptions. What conclusions can be drawn from this? First, of course, that Plato consistently thought of Ideas as different from sensible things. Secondly, and with equal certainty, that he thought of them as completely objective, neither as thoughts nor as the ‘contents of thoughts; (whatever that phrase may mean (sic)), but as entities whose existence is presupposed by all our knowledge. Thirdly, that he thought of them as existing separately from sensible things; but to the question whether Plato consistently so thought of them no simple answer can be given. As a possible answer to the third point he presents an analysis of the words used by Plato in the progression of his works which, on the one hand, imply or suggest the ”immanence” of Forms compared to the group implying or suggesting their “transcendence.” By immanence I assume that he means related but not ontologically separate from sensible things. By transcendence he means ontologically separate. What he finds is that in the early dialogues from the Laches to the Cratylus the words used are completely in the “immanent” category. With the Symposium through to the Sophistes, he finds a mixture of immanence and transcendence. Finally, in the Timaeus, he finds solely members of the transcendent group. In the Philebus he finds few references to the TOI, but those to words in the immanence group. So here in the end Ross places himself in the Developmentalist, as opposed to the Unitarian camp, but not to the extent that he maintains, against the apparent evidence, that Plato abandoned the TOI in later life. Harold Cherniss was for almost forty years a resident scholar at the Institute for Advanced Study at Princeton, from WWII until his death in 1987. He is the author of translations of Plutarch and a series of articles and books dealing with Aristotle’s criticisms of the TOI. His book, Aristotle’s Criticism of Plato and the Academy was widely praised by his peers, while many (Gregory Vlastos and Sir David Ross in particular) in the main disagreed with many of the details of his conclusions. I have briefly discussed Ross’s reaction to ACPA above. Here I want to focus on an essay that Cherniss composed in 1936, prior to ACPA, which I consider a credo in support of the TOI, “The philosophical economy of the theory of ideas.” This essay, originally published in The American Journal of Philology, was reprinted as the first article in R. E. Allen’s book, Studies in Plato’s Metaphysics. Cherniss begins his article by complaining that Aristotle’s characterization of the TOI as a “superfluous duplication of the phenomenal world” distorts what Plato meant by the TOI. His purpose is expressed as follows: “The dialogues of Plato, I believe, will furnish evidence to show that he considered it necessary to find a single hypothesis which would at once solve the problems of these several spheres (ethics, epistemology, and ontology) and also create a rationally unified cosmos by establishing the connection among the separate phases of experience.” But why would one think that all of these spheres COULD be fully explained by a single hypothesis? Cherniss sees the TOI in the early dialogues as saving Socrates from falling into the “plight into which Democritus had fallen.” He portrays Democritus as being bitterly opposed to the relativism of Protagoras, yet vulnerable to counter attack because of his own ethical doctrines saying, “The law seeks to benefit the life of men but can do so only when they themselves design to fare well. For to those who obey it it indicates their proper goodness” (Democritus, fragment 248, Diels). Cherniss says of this, “This bald assertion of a difference between fair and foul things, virtuous and vicious actions offers no standard whereby to determine the difference.” Cherniss represents that the only way to establish such a standard is through a transcendental approach, the TOI. Too bad neither Cherniss nor Plato had had a chance to discuss this issue with Reverend Siddhattha Gotama (aka the Buddha) who simply pointed out that all of us (well, most of us) seek to avoid suffering caused by ego-grasping and that this can be done without resort to ontology! Cherniss goes on to say that “The epistemological necessity for the existence of the Ideas is proved by the same indirect method as was used in establishing the ethical necessity.” He points out the ”brief and casual proof” discussed above to the effect that “if intellection is other than right opinion it follows that there exist separate substantive Ideas as the objects of intellection.” So here we have gone from epistemology to ontology. The nature of the mental processes, then can be explained only by the hypothesis of Ideas. . . Knowledge as a special faculty dealing directly with its own objects must be assumed in order not only to explain the fact of cognition but also to make possible opinion and sensation as they are given by experience. The special faculty of knowledge, however, is characterized by direct contact of subject and object; since phenomena cannot enter into such a relationship with the subject, mediating organs being required in their case, it is necessary that the objects of knowledge be real entities existing apart from the phenomenal world and that the mind have been affected by them before the mental processes dealing with the phenomena occur. Only so can one avoid the self-contradictory sensationalism of Protagoras, the psychological nihilism of Gorgias, and the dilemma of Democritus. One might say that Cherniss is just repeating the arguments of Plato in this, but to this reader, at least, these words seem to have been written by a true believer. Another take on the TOI is that of the continental scholar, Hans Georg Gadamer, who died in 2002 at the age of 102. He was a student of the young Heidegger at Freiburg University and later at Marburg. Gadamer is most well known as the author of Truth and Method, the elaboration of the theory of philosophical hermeneutics. While he was active and probably most well known as a researcher in this highly “postmodern” field, he was also a well-established classical scholar and the author of significant work on Plato, including studies translated into English in the books Plato’s Dialectical Ethics, Dialogue and Dialectic, and The Idea of the Good in Platonic-Aristotelian Philosophy. It would be a disservice to this significant scholar to try to summarize briefly what he has to say in these collections, but I want at least to present a couple of quotes to give the tenor of Gadamer’s approach to Plato. If we intend to study and interpret any one of Plato’s puzzling dialogues carefully and with real concern for what is said in it, it is essential that we become aware of the hermeneutic preconceptions which have given us our image of Plato. That alone would clear the way for us. With a persistence bordering on the absurd, the prevailing form of interpretation in which Plato’s philosophy has been passed on to us has advocated the two-world theory, that is the complete separation of the paradigmatic world of ideas from the ebb and flow of change in our experience of the sense-perceived worlds. Idea and reality are made to look like two worlds separated by a chasm, and the interrelationship of the two remains obscure. Is this “two-world theory” not a persistent part of Plato’s metaphysics? Gadamer goes on to discuss Aristotle’s “almost malevolent dialectical exposition” of the TOI. But he considers Aristotle to really be a “legitimate intellectual confederate” of Plato. This is implied in his book The Idea of the Good in Platonic-Aristotelian Philosophy and by the title of the last essay in Dialogue and Dialectic, “Amicus Plato Magis Amica Veritas”. Gadamer provides a close reading of the Timaeus. An important point which he emphasizes is that in this dialogue, the only one which discusses the physical world in detail, Plato (Timaeus) says that the world was not created by the Demiougos, but put into partial order. And “the truly decisive point is that he orders what is pre-ordered. The crux of the argument here is that the god has to deal with a “mass” which is pre-ordered according to Necessity.” Plato thus sidesteps the “Argument from Evil” against the existence of the Christian god by leaving part of the world to the devil, necessity. He says, “Now one can also say that the creation of the world by the demiurge (or, to say the same thing, the knowing of the world by men) is every bit as much a kind of determination of the indeterminate, an ordering of the unordered. Certainly it is just as true in physics as it is in ethics that ordering is made possible by reason, or better said, that reason perceives the possible order and is therefore able to undertake bringing about.“ Gadamer emphasizes the “probable” nature of Timaeus’s views and the mythical setting for his presentation. This is not a philosophy lecture, but a piece of art. In a sense, however, the mythical portrayal in the Timaeus is meant to be a deeper founding that that which the Socratic reflection about right living in the Philebus can provide. Here, instead of man who learns to seek and produce order in himself, the constitutional order of the world itself is under consideration. Of course it is evident in the Philebus too that the Good and the order of reality as a whole are the real concern. Viewed from man’s perspective, however, the indeterminate appears only as the realm which cannot be subjected to determination, into which one ‘lets matters drop.’ Now the given order of the world presents the demiurge, who exercises the proper ‘practice’, which one calls ‘nature’ with a general limitation. He can only do what is possible. But the ‘possible’ does not restrict him; rather it is more like an ontological opportunity. Only because of the reason already displayed in the realm of Necessity does the beautiful ordering of the visible world become possible at all. . . The utopian vision which functions in Plato as the overall framework for inquiry does not claim in any way to escape the real preconditions and necessities of the human and social task. After the Republic comes the Timaeus. What are we to make of this theory? What was the TOI and to what extent is it relevant to us today? To what extent did Plato’s remain faithful to this version of TOI in later dialogues? In answer to the first and the last of these questions we must conclude that the picture painted by Socrates in the Republic of the TOI retains, at the end of Plato’s life, the central position in his philosophy that it did there. Yes, we see evolution and subtlety in the Parmenides, Sophistes, Politicus, and Philebus dialogues. Yes, we see aporia in the Theaetetus and the Parmenides. But in the end it seems that Plato retains his faith in the objectivity of the ‘world’ of ideas, in their separation from the ‘world’ of sensible reality, and their importance as a cause, in some way, of the Good. To know that what is impenetrable to us really exists, manifesting itself as the highest wisdom and the most radiant beauty which our dull faculties can comprehend only in their most primitive forms – this knowledge, this feeling, is at the center of true religiousness. In this sense, and in this sense only, I belong to the ranks of devoutly religious men. The most revered scientist of the twentieth century was a Platonist! In a complete theory there is an element corresponding to each element of reality. A sufficient condition for the reality of a physical quantity is the possibility of predicting it with certainty, without disturbing the system. In quantum mechanics in the case of two physical quantities described by non-commuting operators, the knowledge of one precludes the knowledge of the other. Then either (1) the description of reality given by the wave function in quantum mechanics is not complete or (2) these two quantities cannot have simultaneous reality. Consideration of the problem of making predictions concerning a system that had previously interacted with it leads to the result that if (1) is false then (2) is also false. One is thus led to conclude that the description of the wave function is not complete. This is not the place to go into the details, but in papers from the 1960s and 1970s presented in the collection, Speakable and Unspeakable in Quantum Mechanics, the Northern Irishman John Bell set out experiments that could prove EPR right or wrong. Multiple experimental results have since followed Bell’s suggestion and proven quantum mechanics right and EPR wrong. In the process, the theory of a “certain” reality has gone by the wayside in physics. Reality is seen now rather as a probable affair in contrast to the metaphysical certainty of the TOI. Not only science, but almost all metaphysics the West from Aristotle to Kant and the Abrahamic religions, Christianity and Islam, have been all deeply influenced by Plato. But there are several other grounds for critique of the TOI, besides the experiments proposed by Bell, one ancient and another more recent.
. . . some have claimed to have discovered the truth, others have asserted that it cannot be apprehended, while others again go on inquiring. Those who believe they have discovered it are the “Dogmatists” specially so called – Aristotle, for example, and Epicurus and the Stoics and certain others; Cleitomachus and Carneades and other Academics treat it as inapprehensible: the Sceptics keep on searching. Hence it seems reasonable to hold that the main types of philosophy are three – the Dogmatic, the Academic, and the Sceptic (Bury’s translation in the Loeb Classical Library). Some people have said that Plato was dogmatic, others that e was aporetic, and still others that he was aporetic in some respects and dogmatic in others. For he shows, they say, a ‘gymnastic’ and aporetic character in his ‘gymnastic’ discourses, where Socrates is introduced either as making sport of someone ore as contending with Sophists, but a dogmatic character where he speaks seriously through Socrates or Timaeus or some such personage. Concerning those who say that he is dogmatic or that he is dogmatic in some respects and aporetic in others, it would be superfluous to say anything now; for they concede his difference from us. The question whether he is, strictly speaking, skeptical, we treat more fully in our commentaries; but now we shall argue in brief, against the school of Menodotus and Aenesidemus (for these most of all advanced this position), that whenever Plato makes statements about the Ideas or about the existence of providence or about the virtuous life being more choice worthy than the wicked, if he assents to these as being more plausible than not, he also abandons the Skeptic character since he gives preference to one thing over another as regards credibility and incredibility. From what has been said before it is very evident that this is alien to us (Mates translation, Outlines, I, 33). I won’t go further into Sextus’s views here. I hope to consider him further in another post. Suffice to say that the sceptic finds Plato’s leap of faith in the TOI an unnecessary step too far. I agree. You ought to consider what Brouwer’s program was [L.E.J. Brouwer 1907]. It consisted in the investigation of mental mathematical construction as such, without reference to questions regarding the nature of the constructed objects, such as whether these objects exist independently of our knowledge of them. That this point of view leads immediately to the rejection of the principle of excluded middle, I can be best demonstrate by example. Intuitionists deny the crucial assumption of the TOI, that intelligible entities are “real” in the sense that they have objectivity. Again, to me this seems a much more credible approach to intellection than the TOI: intellection is a game, a language game, as Wittgenstein called it in the Philosophical Investigations, in which the entire history of the culture has participated and one which follows rules. There is simply no need to take the step to declaring these intellections as existent in a world of their own. They exist in our world, as concepts, expressed in a given language. Kenneth Arrow made his PhD thesis into a book in 1951 (Social Choice and Individual Values). It remains one of the most remarkable works in the strange field of economics in the twentieth century. This is the book that launched a thousand (or more than fifty, anyway) attempts at refutation or compartmentalization by troubled neo-classical economists in the years following its publication. The book starts off with the voting paradox, which Arrow attributes to E.J. Nansen (1896). This goes as follows: if A, B, and C are three alternatives and 1, 2, and 3 are three individuals and supposing that 1 prefers A to B and B to C (and therefore A to C), 2 prefers B to C and C to A (and therefore B to A), and 3 prefers C to A and A to B (and therefore C to B), then a majority (of two) prefer A to B but also B to C. A “rational” conclusion would be that the community prefers A to C; but, in fact, a majority prefers C to A. So the voting procedure has led to a result that is not “rational”. Unfortunately, this paradox is not resolved, but rather deepened as Arrow proceeds. Starting from Bentham’s hedonistic calculus (refuted forcefully by Plato 2500 years ago in the Philebus) and the voting paradox (attributed to Condorcet by many), Arrow proves in math / logical notation that, given five conditions that most neo-classical economists would think should be honored in any theory of social choice, any solution to the social welfare question in which there are at least three alternative choices must either be imposed or dictatorial, thus contradicting two of the assumed conditions. His “possibility” theorem (in the original; it has been referred to as his “impossibility theorem” by many) “shows that, if no prior assumptions are made about the nature of individual orderings, there is no method of voting which will remove the paradox of voting . . . neither plurality voting nor any scheme of proportional representation, no mater how complicated. Similarly, the market mechanism does not create a rational social choice.” (Chapter V, Section 4). In his last chapter Arrow shows that for “single-peaked preferences” majority decision does lead to an outcome satisfying five revised conditions, including the revision to Condition 1 to the effect that “the tastes of individuals fall within certain prescribed realms of similarity” and “provided the number of individuals is odd.”(!) Arrow then asks “Do these or possibly other mathematical restrictions have any social significance?” His answer is “I do not pretend to have any definite answer” but that uniformity of social attitudes actually is a condition of one prominent school of political philosophy, namely the “idealist school” of Rousseau, Kant, and T.H.Green. In a footnote he quotes Rousseau to the effect that the law of plurality is established by agreement, which must have been unanimous, at least in the beginning. Rousseau’s unanimous consent would, of course, satisfy Arrow’s revised Condition 1. So there you have it; the smartest (oddest?) economist of his generation has proven that his “science” cannot be placed on a rational basis given the assumptions that are required for a market economy; and that a market economy cannot produce social benefit! My guess is that the only neo-classical economists that are not worried about this are the ones that remain blind to the issues that Arrow has raised or those who don’t care that their “science” can’t even describe a logically possible world, much less our actual one. Amartya Sen’s 2009 book, The Idea of Justice, will, I think, come to be seen as summing up the intellectual legacy of this remarkable man. The book references hundreds of books, papers, and talks by this Nobel Prize-winning economist with a lifelong weakness for philosophy. Ideas from Sen’s long career starting with his early education at Tagore’s school in Bengal, Santiniketan, to his long years of teaching at Harvard make an appearance in this book. His subject is justice and the book is a comparison of competing theories of justice from Aristotle to Rawls. While the book is dedicated to the memory of John Rawls, with whom Sen taught for many years at Harvard, it is an argument for an alternative approach to Rawls’s justice as fairness, one which emphasizes comparative consideration of social choice and is inspired by Adam Smith’s “impartial spectator” as opposed to Rawls’s “veil of ignorance”. The acknowledgements section of the book presents a lived history of impressive intellectual achievement throughout the last half of the twentieth century. Sen came from Presidency College in Calcutta in the fifties to study at Trinity College, Cambridge where, as a brilliant economics and philosophy student, he was elected to the Apostles, the elite intellectual club of Russell, Wittgenstein, and Moore. He there meets the greats of twentieth century economics and philosophy from both the left and the right sides of the political spectrum including Pierro Sraffa, Maurice Dobb, Dennis Robertson, and his doctoral thesis adviser, the “totally brilliant but vigorously intolerant Joan Robinson.” As his career travels from England to the United States, back to India, and back to England and the US again, his academic acquaintance reads like a Who’s Who of twentieth century philosophical and social thought. He mentions Isaiah Berlin, Richard Hare, Quentin Skinner, Herbert Hart, Simon Blackburn, and Ian Hacking among the British intellectual aristocracy to whom he felt he owed credit for their friendship and criticism. Among the famous American academics with whom he engaged were Kenneth Arrow, W.V. O. Quine, and Hilary Putnam, Robert Nozick, Thomas Scanlon, Michael Sandel, Ronald Dworkin, Martha Nussbaum and dozens of others beyond Rawls. A central argument of the book is that the tradition which Sen calls transcendental institutionalism has led political philosophy into a blind alley, far removed from a large swash of human reality. He critiques this tradition from Thomas Hobbes through John Locke, Jean Jacques Rousseau, David Hume, and Immanuel Kant to John Rawls in our day. The emphasis in this tendency of political theory is on finding the perfect institution that would deliver justice. For Hobbes this is a strong state that overawes the savagery that Hobbes sees in humans as our natural bent. Locke (the confused man’s Hobbes) and Rousseau rest their case on a social contract to ensure security of life, liberty, and (in Locke’s case especially) property. Hume strikes me as not really serious about political philosophy but inclined to Tory-ism by psychological preference. It is Kant, tormented by the scepticism of Hume, that struggles to produce ultimate arguments for the one true ethics, the one true version of justice, in the form of his categorical imperatives. This line of thought leads in the twentieth century to Rawls with his grounding of the theory of justice on a fantasized “original position” of equality which will deliver his “two principles of justice” 1) “Each person is to have an equal right to the most extensive basic liberty compatible with a similar liberty for others” and 2) “Social and economic inequalities are to be arranged so that they are both (a) reasonably expected to be to everyone’s advantage, and (b) attached to positions and offices open to all.” (A Theory of Justice, Chapter I, Section 11) This is Rawls’s “justice as fairness.” That this papers over or ignores existing power relations is believed by Rawls and Rawlsians to be justified by the assumption from which the argument starts of an original situation of equality. Would that such a paradise had been our common origin! Unfortunately, we live in a world in which power has not evolved from such impeccable roots! A key dichotomy for Sen is the contrast between Rawls’s “veil of ignorance” and Smith’s “impartial spectator” as a central technique for arriving at just results. Rawls’s famous thought experiment put the emphasis on a hypothetical original condition in which differences of wealth and power are assumed to be suspended and the participants in the process of choice are presumed to be free to develop just solutions: “Among the essential features of this situation is that no one knows his place in society, his class position or social status, nor does any one (sic) know his fortune in the distribution of natural assets and abilities, his intelligence, strength, and the like” (A Theory of Justice, Chapter 1, Section 3). In contrast, Smith’s approach in The Theory of Moral Sentiments was to rely on consideration of the views of an impartial spectator before arriving at a choice. Sen spends much of this book in a respectful critique of Rawls’s theory. Mine would be much shorter: Rawls’s theory ignores existing power relations. Since we will never be in a world without existing power relations, a theory that imagines what results would arise in a situation of hypothetical equality has very little cash value to us poor mortals. In Smithian analysis, the relevant judgements can come from outside the perspectives of the negotiating protagonists; indeed, they can come from, as Smith puts it, any ‘fair and impartial spectator’. In invoking the impartial spectator, it is not, of course, Smith’s intention to give over the decision-making to the final arbitration of some disinterested and uninvolved person, and in this sense the analogy with legal arbitration does not work here. But where the analogy does work is in making room to listen to voices not on the grounds of their coming from the group of deciders, or even from interested parties, but because of the importance of hearing the point of view of others, which may help us to achieve a fuller – and fairer – understanding. Indeed, the entire approach of the ‘impartial spectator’, on which the view developed in this work draws, focuses on the relevance of the society – and people far and near – in the valuation exercise of individuals. . . . To note the role of ‘thinking, choosing, and doing’ by individuals is just the beginning of recognizing what actually does happen (we do, of course, as individuals, think about issues and choose and perform actions), but we cannot end there without an appreciation of the deep and pervasive influence of society on our ‘thinking, choosing, and doing’. Anyone who has tried to have a conversation with a dyed-in-the-wool libertarian (any conversation with a libertarian will eventually bring you around to the “free” market and the quest for liberty) will recognize the attitude to which Sen is reacting here. I relay a thread of one such interaction in the post Investing in Gold. One could say that much of the theory of neo-liberal economics is based on the illusion of isolated individual choice against which Sen argues here. Social choice theory is a very broad discipline, covering a variety of distinct questions, and it may be useful to mention a few of the problems as illustrations of its subject matter (on many of which I have been privileged to work). When would majority rule yield unambiguous and consistent decisions? How can we judge how well a society as a whole is doing in the light of the disparate interests of its different members? How do we measure aggregate poverty in view of the varying predicaments and miseries of the diverse people that make up the society? How can we accommodate rights and liberties of persons while giving adequate recognition to their preferences? How do we appraise social valuations of public goods such as the natural environment, or epidemiological security? Also, some investigations, while not directly a part of social choice theory, have been helped by the understanding generated by the study of group decisions (such as the causation and prevention of famines and hunger, or the forms and consequences of gender inequality, or the demands of individual freedom seen as a “social commitment”). The reach and relevance of social choice theory can be very extensive indeed. In other words, he attempts to abandon the vain effort to close the system of neo-liberal economics by permitting multiple outcomes and multiple reasons to bring about comparative good, rather than transcendental perfection. I doubt that neo-liberal economics’s severest critics would judge that this effort has been successful, but the Nobel committee was apparently convinced. The current reviewer must have great sympathy for the lifetime of effort of this man which has produced real good in the world by justifying efforts to do so. As I have mentioned above, Mary Wollstonecraft is one of Sen’s heroes, and for good reason. He proudly repeats her rejoinder to Burke’s famous complaint against the French Revolution. In her letter to Burke, she has the temerity to point out the shallowness of Burke’s defense of the American colonies. By ignoring the institution of slavery in England’s American colonies, he was condemning millions of souls to intolerable suffering. While proclaiming the right of the owners of slaves to political independence, he was silent on the rights of those slaves. Am uppity woman indeed! And one who put the great liberal / conservative Burke firmly in his place. That Wollstonecraft would be a hero of Sen’s is quite fitting, since he has been a champion of women’s rights in the twentieth century and a frequent associate of Martha Nussbaum, a twentieth century defender of the rights of women. One of the great problems for Sen in trying to extend a theory which is based in Bentham’s hedonistic calculus is that he realizes that Bentham’s hedonism cannot be justified as the sole principle of justice. As Moore pointed out 100 years before, Plato destroyed hedonism as a theory of ethics in the Philebus. The fact that 150 years of economic “science” has been based on this failed theory is an embarrassment to this profession, but also a big problem for Sen. An example of his approach to dealing with the problems that hedonism presents is his argument for recognizing that the fact that the poor don’t complain about their poverty is no reason to conclude that this it is justified. The utilitarian calculus based on happiness or desire-fulfillment can be deeply unfair to those who are persistently deprived, since our mental make-up and desires tend to adjust to circumstances, particularly to make life bearable in adverse situations. It is through ‘coming to terms’ with one’s hopeless predicament that life is made somewhat bearable by traditional underdogs, such as oppressed minorities in intolerant communities, sweated workers in exploitative industrial arrangement s, precarious share-croppers living in a world of uncertainty, or subdued housewives in deeply sexist cultures. The hopelessly deprived people may lack the courage (or opportunity, my emphasis) to desire any radical change and typically tend to adjust their desires and expectations to what little they see as feasible. They train themselves to take pleasures in small mercies. It is in this part of Bentham’s argument that Sen bases his critique. His general argument is that Bentham assumes that rights must be based on legal authority, but to say that there are rights to “liberty,property, security, . . . ” stands on much the same ground as for Bentham to declare, as he did, a utility based ethics. The argument as to which should be used as the basis for legal standing is one of competing ethical theories. The rights argument cannot be dismissed so easily. In his penultimate chapter Sen argues that public reasoning can lead to a justification of rights. The force of a claim for a human right would be indeed seriously undermined if it were possible to show that it is unlikely to survive open public scrutiny. However, contrary to a commonly offered reason for scepticism and rejection of the idea of human rights, the case for it cannot be discarded simply by pointing to the fact – a much-invoked fact – that in repressive regimes across the globe, which do not allow public discussion, or do not permit free access to information about the world outside the country, many of these human rights do not acquire serious public standing. The fact that monitoring of violations of human rights and the procedure of ‘naming and shaming’ can be so effective (at least, in putting the violators on the defensive) is some indication of the reach of public reasoning when information becomes available and ethical arguments are allowed rather than suppressed. Uncurbed critical scrutiny is essential for dismissal as well as for justification. Not a knock down argument for human rights, perhaps, but an argument good enough for a sceptic till another comes along. It is election season in the United States. The Republican Party’s “Big Idea” this year, as it has been since the 1980s, is that low top tax rates inspire the “job creators” to hire more workers and give them more pay. This “Big Idea” is, of course, a bald-faced and cynical lie. It is bald-faced because there is ample data to contradict it and it does not follow from analysis of the logic of the question. It is cynical, because this lie is hiding a fact that they refuse to grant: that what low income tax rates surely do is to advance the interests of the top 1% of wealth holders, even if that means that overall economic growth is held back as a result. Once you have considered this question carefully, I think you will come to the conclusion that I have: The 75% rate gives much more incentive to the “job creator” to invest her small business income in the business, rather than to take that money out of the business and pay a high income tax. The 25% upper income tax rate, on the contrary, gives the incentive for the small business operator to take the money and run, since the income tax burden on money taken out of the business as personal income is so very low. Now let’s consider the evidence. The graph above presents data on income growth since 1961 in the United States, compared with the top rate of income tax. The income data come from World Bank data on GDP. I converted annual income estimates in inflation-adjusted 2010 dollars to an annual rate of change. The income tax rate data are available from several sources. Full data have been presented by the National Taxpayers Union (History of Federal Individual Income Bottom and Top Bracket Rates). Since 1961 the average growth rate in average per capita income in the United States has been 5.5 percent. During the years when the tax rate was equal to or higher than 70%, from 1961 through 1975, the average per capita income growth was 6.2 percent. During the years when the top tax rate was less than 40 percent (from 1992 to 2007), the average per capita income growth rate was 3.6 percent. Now let’s compare the data as a correlation. 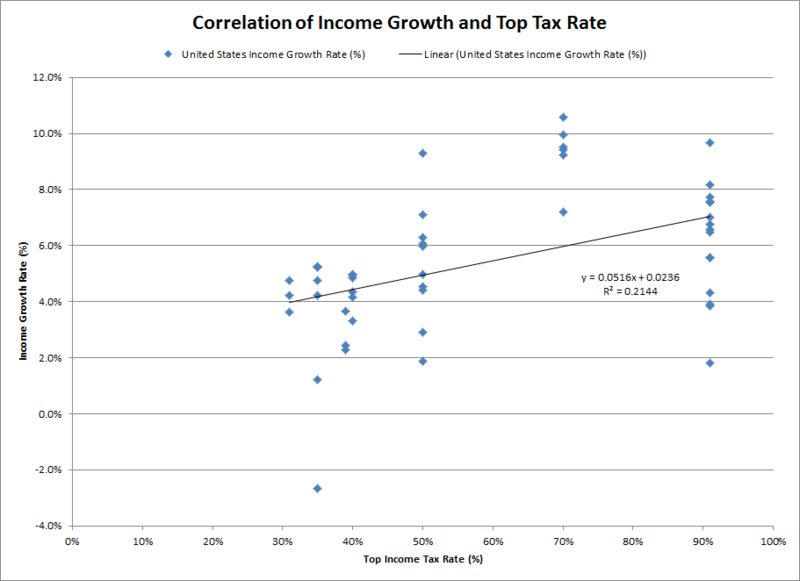 The graph above shows a reasonably good correlation coefficient, indicating a positive trend in income growth with increased top tax rate. Of course, there were a lot of factors that went into higher rates of income growth in the 1960s and 1970s, when the top tax rates were 70% or greater, than in recent years, when the tax rate has been successively lowered (almost exclusively by Republican administrations). But I think we can take this correlation as some evidence, at least, that the Republican’s “Big Idea” is false. And this analysis has been based on average per capita income. If one were to look at the median income, the situation would be worse for the working person because of the increase in inequality since 1980. So much for the Republican Party’s “Big Idea” that low top tax rates inspire the “job creators” to hire more workers and give them more pay. By asking the question above we see the faulty logic of this. And the income growth statistics bear out this conclusion. Now let’s consider the cynical part. Why are the Republicans so interested in lowering the tax rate on top income earners, if it is bad for the national economy in general? This last bit of the story is shown in the graph above: There has been a significant increase in inequality in proportion to the drop in the top income tax rates that we have seen under successive Republican presidents and Congressional majorities. These data come from studies by University of California sociology professor Willam Domhoff (Wealth, Income, and Power). After forty years of reduced tax rates (from the 70-95 percent that they were for forty years before) the proportion of US wealth held by the top one percent of wealth holders has gone nearly back up to where it was in 1929, before Roosevelt’s Congress raised the rates precipitously. The portion of the nation’s wealth held by the richest Americans in 1929 was about 44% when the top tax rate was 24%. The top rate rose to 63% during the thirties and 91% in 1945, and it remained over 70 % until 1976. By 1976 the portion of the nation’s wealth held by the 1% had fallen to 20%. High top rates succeeded in reducing wealth disparity. But then the Republicans took over. The top tax rate was lowered to as low as 28% during the Reagan years and to 31% in 1992. As we all now remember, Clinton raised the top rate to 40%, and then lowered it to 39%. Bush II lowered it to the current 35%, where it remains. By 1995 the wealth portion of the rich was back up to 39% and it has remained in that neighborhood since. This graph shows this wealth data as a correlation. 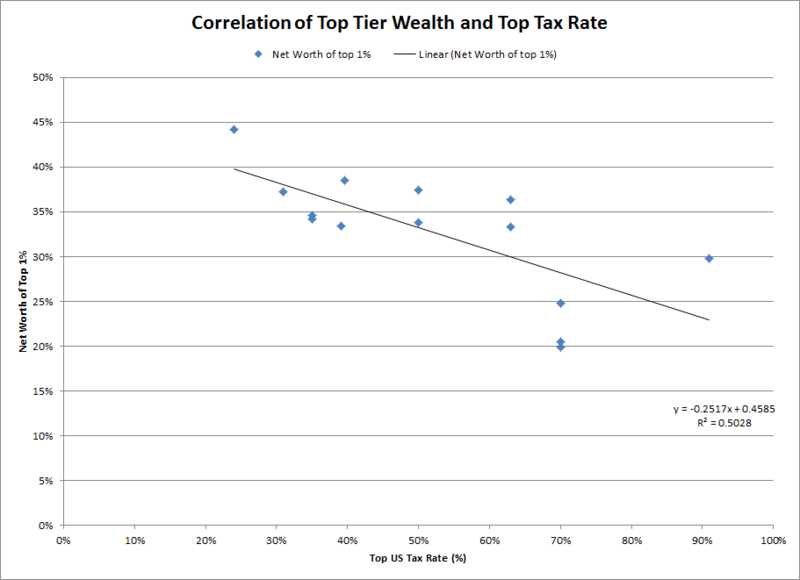 It shows an even stronger (negative) correlation between the wealth of the one percent and the top income tax rate than for income growth. There is a very clear correlation that promises good news for the one percent as the tax rate is lowered. But what is the causation here? 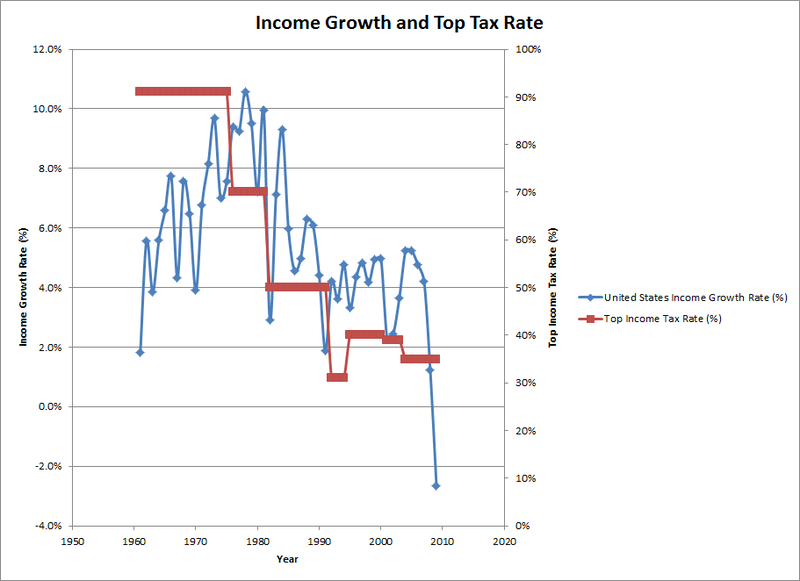 Does inequality cause low rates of growth because the top tax rates are too low? We have seen that poor income growth is correlated with low top income tax rates and we have seen that low tax rates are highly correlated with increasing concentration of wealth. 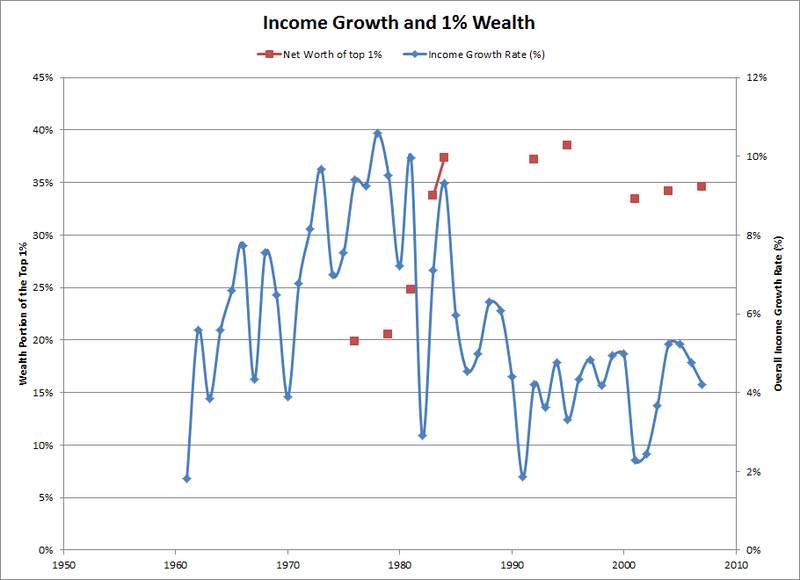 As a final comparison, let’s plot the income growth and wealth concentration data together. The graph above shows these data as a time series. I don’t have income growth data prior to 1961, but for the comparisons after 1976, when I have data for both income growth and wealth concentration, we see that as wealth concentration increased in the post-Reagan years, income growth dropped significantly. 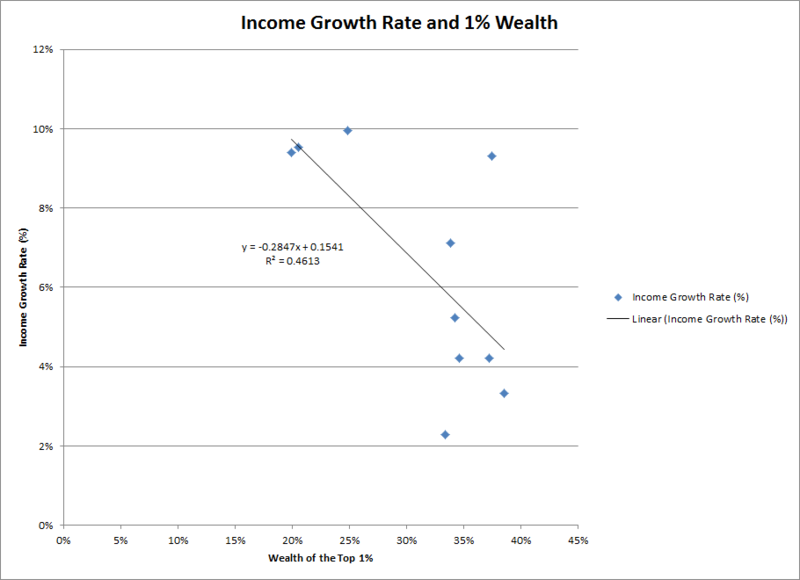 The final graph here shows income growth and wealth concentration as a correlation. Here we find the strongest correlation of all indicating that as concentration of the wealth increases income growth declines. This is a conclusion that makes sense. Poorer people spend relatively more of their income in the general economy than the rich. So increasing wealth concentration results in less overall economic activity and lower rates of growth in average incomes. So does increased inequality suppress economic growth? It appears that it does. 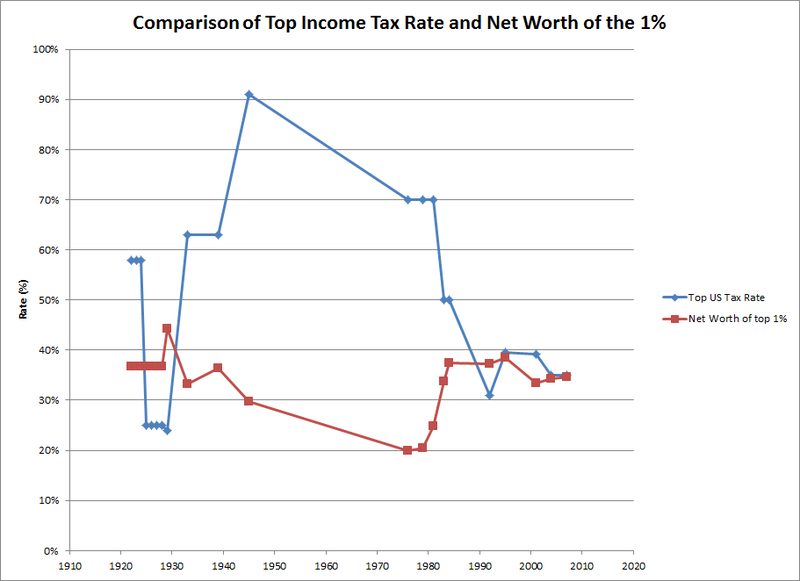 Do lower top tax rates increase wealth concentration into the hands of the very well off. Yes, it it appears they do. And that is not such a difficult conclusion to understand. The only remaining question is why the US electorate would stand for this. There is little question what is going on here in the Republican message: Lower the rate to fatten the one percent, even though this reduces not just wealth equality, but also overall economic growth in society. It doesn’t just grab more of the pie for the rich; it also reduces the overall growth rate of the pie. How has this been possible? Well, it seems to this reviewer that it has been possible because, regardless of the bad outcomes for the overall economy of low top income tax rates, the elites benefit famously. And they are able to control the process through their influence in Congress and by funding massive advertising and media campaigns to keep the electorate misinformed. This has accelerated with the Citizens United decision by a Republican-nominated Supreme Court. So in conclusion: The “lower the top income tax rate to grow the economy” message, which is the Republican Party’s “Big Idea”, is a bald-faced and cynical lie. The question is not why we should raise the top rate to 39% again, as Obama has suggested, but why we should not raise it to 75%. I will leave that as another question for you to ponder. Chang is currently a professor in the Faculty of Economics at Cambridge University (Cambridge on the Cam). You can find his mini-biography on his blog here: http://hajoonchang.net/my-background/. He is the author of a number of texts (he lists 14 books on his blog) in the economics of development, including the recent work, 23 Things They Don’t Tell You about Capitalism. For a quick summary of these 23 things you might look here: http://www.huffingtonpost.com/ian-fletcher/a-review-of-ha-joon-chang_b_840417.html. The resulting book, while perhaps not as ‘cool’ as the 23 Things book, is full of tongue-in-cheek humor backed up with well-informed factual argument. The book includes examples from development stories around the globe, but especially from his native Korea. The theories of the neo-liberal visionaries are devastatingly criticized in the book, but for the most part he does not attack them by name. Rather, he describes examples of policies implemented by the World Bank and International Monetary Fund (IMF) which have been informed by neo-liberal development theory and points out how these policies have often led to the opposite outcome from what their proponents claim for them. An exception to this rule is Thomas Friedman, neo-liberal journalist, whose book The Lexus and the Olive Grove is isolated for criticism in Chapter 1 as embodying the fictitious history of neo-liberal development theories, as opposed to the real history of less-than expected success or outright failure. For me the most revealing story in the book comes in the early going in Chapter 2 in which Chang reviews the history of how today’s rich countries became rich. He conclusively shows that this was not by following the free trade policies that have been advocated by the World Bank and IMF to developing countries in the past forty years. Chang resurrects a long forgotten work in economics by Daniel Defoe, the author of the famous character of Robinson Crusoe. Defoe had a colorful career besides his life as an author of literature. He was a businessman, tax collector, political commentator, and spy for both Tory and Whig governments. He was also an economist. Defoe’s book on economics, A Plan for the English Commerce (1728), tells the story of how the Tudor monarchs, Henry VII and Elizabeth I, used “protectionism, subsidies, distribution of monopoly rights, government-sponsored industrial espionage and other means of government intervention to develop England’s woolen manufacturing industry – Europe’s high-tech industry at the time.” Defoe’s character, Robinson Crusoe, is often used as an example by neo-liberal economists of homo economicus, the rational self-interest seeker who drives the development of free market economies. But Defoe’s actual work on economics shows “that it was not the free market but government protection and subsidies that developed British woolen manufacturing.” This is opposite of the story told by Acemoglu and Robinson. They give credit to the abandonment of protectionism as the spur to Britain’s growth, but it doesn’t occur to them that without that protection, Britain’s growth wouldn’t have gotten off the ground. After the Napoleonic Wars when the protectionist policies of the Tudors had been able to establish British manufacturers as the most efficient in the world, these manufacturers recognized that free trade was now in their interest. The manufacturers agitated in favor of the abolition of the Corn Laws that kept low cost grains from being imported to feed the industrial workers of the New Britain. It is at this juncture in the history of the industrial revolution in Britain that David Ricardo, economist, politician, and stock-market player, originated the theories of free trade that are parroted by neo-liberal economists today. A perfect example of this is the United States in the nineteenth century. Adam Smith had argued that the Americans should not develop manufacturing. Thomas Jefferson agreed. But thanks to Alexander Hamilton, who became America’s first Treasury Secretary at the age of 33, a different policy was followed. Hamilton’s Report on the Subject of Manufactures from 1791 presents a rationale for what became the program for development of industry in the United States. The core of this idea was that “a backward country like the US should protect its ‘industries in their infancy’ from foreign competition and nurture them to the point where they could stand on their own feet.” Following the issuing of Hamilton’s report to Congress the average tariff on foreign manufactured goods was raised from 5 percent to 12.5 percent, but this was far short of his recommendations. But after Hamilton’s death (after the famous duel at Weehawken with Aaron Burr) his program was adopted in full. After the War of 1812, the US Congress raised tariffs to an average of 25 percent. Once elected in 1860, Lincoln raised industrial tariffs to the highest levels so far in US history. This was justified by the expenses of the Civil War, but tariffs on manufactured goods remained at the 40 to 50 percent level until the First World War, the highest of any country in the world at the time. How many Americans realize this fact about their history? And despite having the highest tariffs in the world, the US in the nineteenth century was the fastest growing economy in the world. Free trade economists have argued that this was in spite of protectionism, but Chang points out that the same story has been repeated over and over again in the century that followed; by Germany, Sweden, France, Finland, Austria, Japan, Taiwan, and Korea. Another example of a cherished neo-liberal policy story where the facts look much different from the theory is told in his Chapter 7 on financial prudence. Low inflation is gospel for neo-liberalism. “Inflation is bad for growth – this has become one of the most widely accepted economic nostrums of our age.” But during the 1960s and 1970s while Brazil’s average inflation rate was 42 percent per year, its per capita income grew at 4.5 percent per year. During the period when Brazil embraced neo-liberal policies between 1996 and 2005, its inflation rate dropped to 7.5 percent per year, but its per capita growth rate also dropped to an average of 1.5 per cent per year. A similar story played out in Korea, which had inflation rates close to 20 percent in the 1960s and 1970s while its economy was growing at ‘miracle’ rates of 7 percent per year. Chang insists that “I am not arguing that all inflation is good. . . . But there is a logical jump between acknowledging the destructive nature of hyperinflation and arguing that the lower the inflation rate, the better.” The inflation rate does not have to be in the 1 -3 percent range for economic growth to occur. The examples of Brazil and Korea show this. There is much else in this book which debunks long cherished apparent truths of neo-liberal development economics: the story of Finland’s refusal to permit significant foreign investment in their country; the story of the Pohang Iron and Steel Company (POSCO), which grew to be the third largest steel company in the world (in 2008), but started as a state-owned (Korean) enterprise; the story of the economic success of Singapore with its state-owned premier airline and a host of government-linked enterprises in telecom, power, transport, semi-conductors, shipbuilding, engineering, shipping, and banking. All of these stories (and others) are worth reading. You can hear Chang talking to Amy Goodman in 2009 about Bad Samaritans here: http://www.democracynow.org/2009/3/10/economist_ha_joon_chang_on_the. He comes across as either extremely naive in the ways of US politics or completely deadpan in his reply to Amy’s question that the proper response to the financial crisis of 2008 would have been to nationalize the US banking sector. He gives very reasonable arguments why this should have been done and points out that many countries have had successful growth with essentially public ownership of banking; for example, France. He doesn’t seem to realize how crazy we really are. Apparently he hasn’t been watching Fox News. Levy’s book traces out the life of Moore from the Quaker and evangelical roots of his “intellectual aristocracy” family through his early schooling and then his life at Cambridge up until the years of the First World War. He especially focuses on Moore’s membership in The Apostles, or The Cambridge Conversazione Society, founded in 1820 and whose connections with Moore up until the First World War Levy tracks. There is an appendix with all of the names of members from 1820 through 1914. We find here many famous names, including Alfred Tennyson, William Kingdon Clifford, Henry Sidgwick, Alfred North Whitehead, John McTaggart, Bertrand Russell, E.M. Forster, Lytton Strachey, Leonard Woolf, John Maynard Keynes, and Ludwig Wittgenstein. Moore’s first paper read to The Society in May 1894 was entitled “What End?” Levy says about this paper that it is “muddled, confused, and confusing” but that it is “nonetheless a document of great importance: first, because it shows that Moore, who was sitting part I of the classics tripos practically at the time of its delivery, was already interested in and familiar with contemporary philosophical questions. Secondly, this first foray into philosophy is important because Moore’s later refutation of its principle thesis is one of the main strands in the development of Principia Ethica.” The paper begins with a general introduction and proceeds to a discussion later remembered by Russell as starting with “In the beginning was matter and then came the devil.” But the paper was not a demonstration, as Russell writes, that “Moore was an ardent disciple of Lucretius” but rather was an early profession of hedonism, later to be attacked in Principia Ethica (PE). Levy maintains that while the Bloomsbury group hero-worshiped Moore and took PE as their Bible, they didn’t seem to have read, or at least paid much attention to anything in the book besides the last chapter, “The Ideal.” In my view, Moore’s first book is important as a watershed which sorted the sheep from the goats in the previous century of ethical thought; from the utilitarianism of Bentham and Mill to the “metaphysical ethics” of Kant. Moore rejected both, finding them both guilty of the “naturalistic fallacy,” a fallacy that he coined. PE is so important that I will leave off here talking about Levy’s book and go on to it directly. PE was first published in 1903 and it is still in print today. I would think that there is hardly an introductory university course in ethics that could do without some mention of it. Moore says in the preface that the book is intended to sort two kinds of questions. “The two questions may be expressed, the first in the form: What kind of things ought to exist for their own sakes? the second in the form: What kind of actions ought we to perform?” In this preface he says the “One main object of this book may, then, be expressed by slightly changing one of Kant’s famous titles. I have endeavored to write a ‘Prolegomena’ to any future Ethics that can possibly pretend to be scientific.” It is interesting that he expresses hopes at a “scientific” Ethics, for most modern proponents of “scientific” ethics (like Sam Harris) are proponents of some version of the utilitarianism that Moore attacked savagely in PE. PE is divided into six chapters and it is convenient to discuss the book under subheadings provided by these chapters. He considers two example contenders for the definition of “good”: 1) good is pleasure or 2) good is that which is desired. In the first case the person claiming this is saying that the object of his desire is not pleasure, he contradicts himself directly. “If good is defined as something else, it is then impossible either to prove that any other definition is wrong or even to deny such a definition.” In the other case, he says “the discussion is after all a verbal one. When A says ‘Good means pleasant’ and B says ‘Good means desired.’ They may merely wish to assert that most people have used the word for what is pleasant and for what is desired respectively.” Only this is not an “ethical” discussion, according to Moore. The other well-known topic taken up in Chapter one is Moore’s take on Hegel’s “organic whole” or “organic unity”. Moore insists that “in considering the different degrees in which things themselves possess this property (goodness), we have to take into account of the fact that a whole may possess it in a degree different from that which is obtained by summing the degrees in which its parts possess it.” (PE, p. 36) What he means by this is taken up in his last Chapter. In his second Chapter Moore takes on those ethical theories that he feels commit his NF. These include Stoic Ethics, for they declared ethics to be the task of discovering a ‘life according to nature.” He defers his (brief) discussion of the Stoics and their metaphysical ethics to Chapter IV, however. In this chapter Moore bores in on Herbert Spencer’s “Evolutionistic Ethics” (in The Data of Ethics) for ridicule. Evolutionistic ethics in his mind defines the good as that which is “natural” and for that reason, is “therefore certainly fallacious”; that is, not included in the category of ethical knowledge according to Moore’s definition. He derides Spencer for “’constantly’ using the term ‘more evolved’ as equivalent to ‘higher.’” He is not sure whether to criticize Spencer as an evolutionistic ethicist or as a hedonist. But when Spencer says that ”‘virtue’ cannot ‘be defined otherwise than in terms of happiness’” Moore declares him therefore guilty of the NF. Moore has a separate chapter for Hedonism, which he sees as a special case of the NF. Here he credits Henry Sidgwick (a fellow Apostle) for “clearly recognizing that by ‘good’ we do mean something unanalysable” and who “has alone been led thereby to emphasise the fact that, if Hedonism be true, its claims to be so must be rested solely on its self-evidence – that we must maintain ‘Pleasure is the sole good’ to be a mere intuition.” His refutation of Hedonism he explains as follows: “In fact, my justification for supposing that I shall have refuted historical Hedonism, if I refute the proposition ‘Nothing is good but pleasure’ is that although Hedonists have rarely stated their principle in this form and though its truth, in this form, will certainly not follow from their arguments, yet their ethical method will follow logically from nothing else.” (PE, p. 61) Among the group of Hedonists he includes Aristippus, founder of the Cyrenaic school and follower of Socrates, the Epicureans, and the Utilitarians: Bentham, Mill, Spencer, and Sidgwick. Having finished with Mill, in his mind, he moves on to Sidgwick. He maintains that Sidgwick has seen the inconsistency between the Hedonistic principle that “Pleasure is the sole good” and that one pleasure may be better than another. Yet, he still chooses “Pleasure alone is good as an end.” His case against Hedonism ultimately rests on Socrates’s discussion with Protarchus in the Philebus. Socrates gets Protarchus to admit that although he has maintained that to “live your whole life in the enjoyment of the greatest pleasures” is his doctrine, he is speechless when Socrates explains that intelligence, memory, knowledge, and wisdom would be excluded from such a life. In this Chapter Moore moves on to the Stoics, Spinoza, and Kant. “They all imply, and many of them expressly hold, that ethical truths follow logically from metaphysical truths – that Ethics should be based on Metaphysics.” He defines metaphysics as a “profession to prove the truth about non-natural existents. I define ‘metaphysical,’ therefore, by a reference to supersensible reality; although I think that the only non-natural objects, about which it as succeeded in obtaining truth, are objects which do not exist at all.” The Stoics, for example, asserted that a life in accordance with Nature was perfect. But they did not mean “Nature” as Moore defines it, but “something supersensible which they inferred to exist, and which they held to be perfectly good.” He deals likewise with Spinoza’s Absolute Substance and ‘intellectual love’ of God and with Kant’s “Kingdom of ends” which is ideal. And with modern writers “who tell us that the final and perfect end is to realize our true selves.” (PE, p. 113) But, remarkably, Moore indicts the metaphysical ethicists of NF: “They . . . imply, as I said, that this ethical proposition follows from some proposition which is metaphysical: that the question ‘What is real?’ has some logical bearing upon the question ‘What is good?’ It was for this reason that I described ‘Metaphysical Ethics in Chapter II as based upon the NF.” He ends up maintaining that, just like being good is not just experiencing pleasure, being good is not identical with being willed (a la Kant) or felt in a certain way. Perhaps it is the right place here to bring up Bernard Williams’s comment that “It is hard to think of any other widely used phrase in the history of philosophy that is such a spectacular misnomer” as the NF (Ethics and the Limits of Philosophy, p. 121). Williams says the NF is not in Moore’s usage a mistake in inference as opposed to what “in Moore’s view was and error, or else simple redefining the word.” To be fair to Moore, he often finds mistakes in inference (most commonly by reductio) in the arguments of his opponents. But there is something to Williams’s quarrel that when Moore argues by induction or points out inconsistencies in deduction he is never alive to the irony as old as Sextus Empiricus that neither induction nor deduction can be defended as anything more than conventional argument, even though Moore at one point says, “it follows from the meaning of good and bad, that such propositions are all of them, in Kant’s phrase, ‘synthetic’: they all must be simply accepted or rejected, which cannot be logically deduced from any other proposition.” And we know this, not just from Sextus Empiricus, but also from Moore’s bête noir, J.S. Mill. The last Chapter of PE seems to have been the only chapter read seriously by the artists and aesthetes of the Bloomsbury group. It is here that Moore finds that the “ideal” state of affairs is that which is “generally good in itself.” Here he finds in personal affection and aesthetic enjoyment “by far the greatest goods with which we are acquainted.” He here argues for the value of knowledge and of the intrinsic superiority of knowledge based on reality, as opposed to an imagined reality. He finds that “cognition of material qualities, and even their existence, is an essential constituent of the Ideal or Summum Bonum.” The book ends with a consideration of 1) unmixed goods, 2) evils, and 3)mixed goods. At this point, a weary reader may be excused for wondering if the whole chapter doesn’t fall under the category of the famous NF! This paper comes from the end of Moore’s long and distinguished career as the King of Cambridge. Perhaps he had just gotten tired of all the wrangling, as have I.